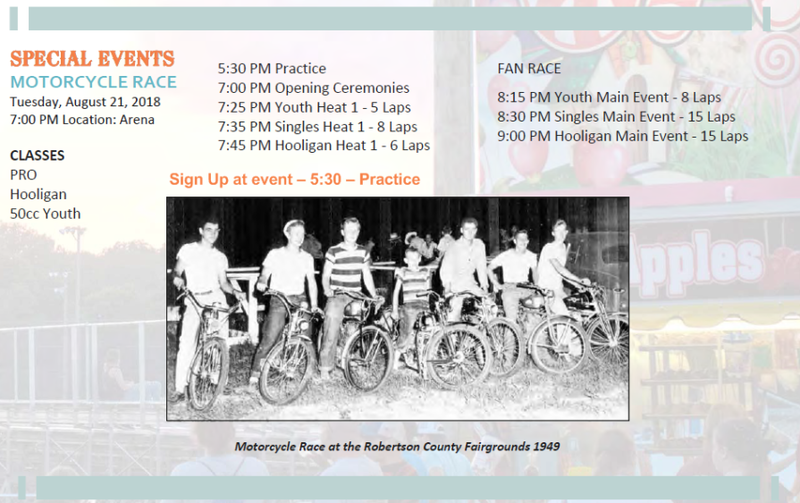 ROBERTSON COUNTY TENNESSEE: (Smokey Barn News) – The Annual Robertson County Fair Kicks off Monday, August 2o and this year is the 151st year anniversary. 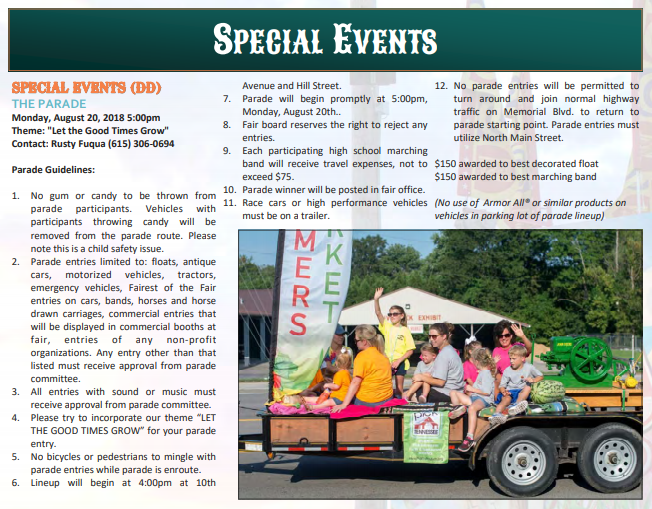 The fair will begin with its annual parade on Memorial Blvd in Springfield at 5pm. The Fair Board members have worked hard over the last year to make many changes and improvements to the fairgrounds and the fair itself. The Robertson County Fair Association is a non-profit organization that is completely self-supporting and is run solely by volunteers. Since its establishment in 1938, the Robertson County Fair Association has celebrated all things Robertson County by promoting agriculture, education, and community involvement through quality entertainment in a family-friendly environment. 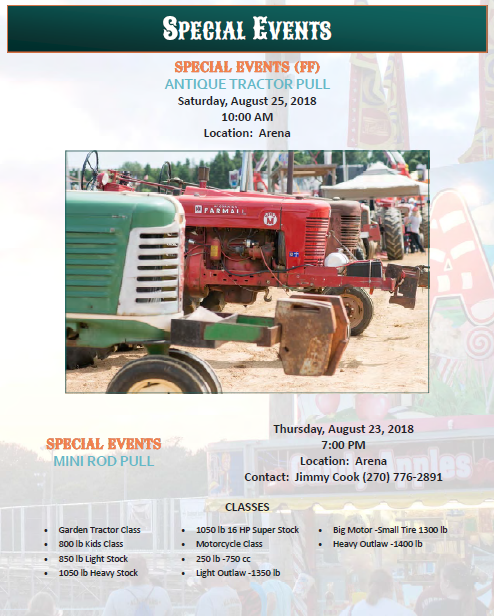 Fairest of The Fair, Arena Events For All Ages, Truck/Tractor Pulls, Demolition Derby, Robertson County’s Finest in Baking, Crafts, Art, Photography, Canning, Tobacco and Livestock. Carnival Rides, Vendors and more for the whole Family! annual county fair, as well as providing a variety of entertainment and programs through our many other events. On that note, they would like to remind everyone that the Robertson County Fair is not just the carnival rides. The Robertson County Fair is everything including the carnival. It’s the arena events, the entertainment at the stage, all the entries from locals (i.e. Baking, crafts, art, photography, canning, tobacco, etc…). It’s about our community coming together. It’s about the 4-H, FFA and FCCLA kids being proud of the work they have done and showcasing the items and animals they have worked hard at creating or raising. So please stop in the Main Exhibit Building and check out all their hard work, they would really appreciate it. Be watching you gardens for that perfect Blue Ribbon item and enter it in the Robertson County Fair August 19th. 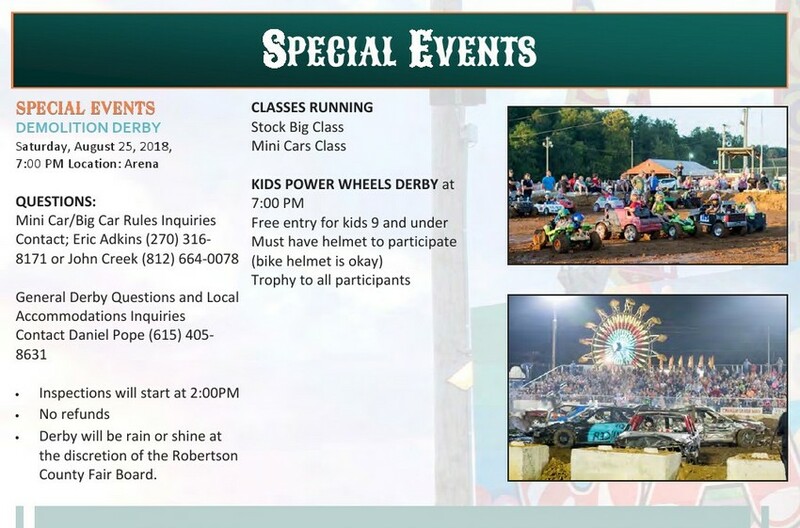 • 7:00 PM Motorcycle Races – Arena (Sign Up at event – 5:30 – Practice) • 7:00 PM NOTE: Due to the promoter being in the hospital, we have had to cancel the dirt bike event for Tuesday night. We apologize for the inconvenience. Coming in August to the Robertson County Fair . . . The BABY SHOW contest will be held Saturday, August 11, 2018 at 9:00AM. Click here for APPLICATION, RULES & GUIDELINES. TODDLER & JUNIOR event will be held Saturday, August 11, 2018 at 11:00AM. PRE-TEEN, TEEN & SENIOR event will be held Saturday, August 11, 2018 at 6:30PM.